In response to the mundane ease of modern travel, Hendrick's Gin has developed the world's only flying cucumber—a 130-foot dirigible that clips along at the civilized speed of 35 mph, just slow enough not to blow off your steampunk hat. 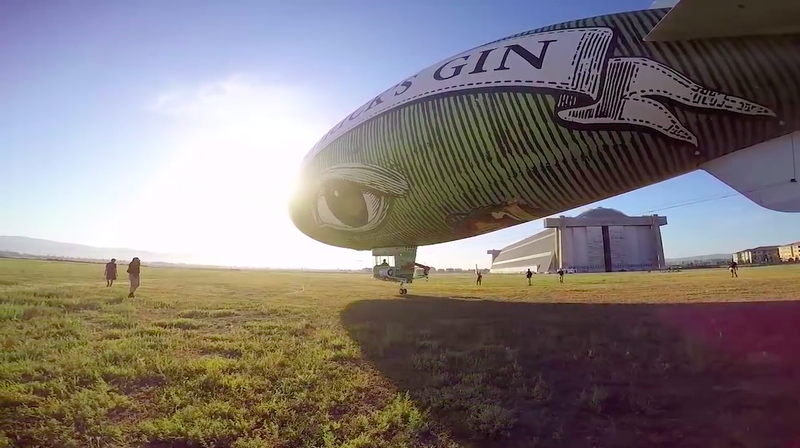 They are whipping out their big cucumber in 13 cities across the nation and giving a very small number of lucky gin lovers a brief yet glorious ride on the airship. They will be in New York on June 14, just in time to coincide with England's National Cucumber Day. If you are wondering why a cucumber, Hendrick's Gin is flavored with both cucumber and rose—you know, a phallic symbol and a yonic symbol infused into one gin (it would be a lot harder to make a rose-shaped airship). And if you're wondering why anyone in their right mind would build a blimp, you simply have to look to the history of gin itself. Though the brand was created in 1999, Hendrick's is sold in an old-fashioned apothecary bottle, and the visual essence of the brand seems quite nostalgic for the time when gin was the most popular drink in England, consumed at a rate of two pints per Londoner per week—you know, right before it was blamed as one of the main causes of crime and became strictly regulated with the Gin Act of 1751. But oh, to go back to the gay times of the gin craze! Back to 1785 and the first crossing of the English Channel by hand-propelled balloon. So, sign up for this very limited engagement and what will probably be your only chance to sip "dirigible-inspired" cocktails in an actual dirigible.